When Should Your Wisdom Teeth Be Extracted? Your wisdom teeth are the third molars in your mouth. They typically develop and appear between the ages of 17 and 25. However, everyone is different. Therefore, the growth of your wisdom teeth should be monitored by your dentist in Asheville. Because everyone is so unique, there is no specific age that your wisdom teeth should be extracted by, although it is recommended that they be removed by in early childhood. This typically limits the possible risks and encourages faster healing time. What if You Wait Too Late to Get Your Wisdom Teeth Extracted? Impacted Wisdom Teeth – When the third molar becomes crowded, it does not have sufficient room for growth. This can result in pain and damage to other teeth. Tooth Decay – Wisdom teeth can be harder to reach than other teeth. This makes them more susceptible to gum disease and tooth decay. 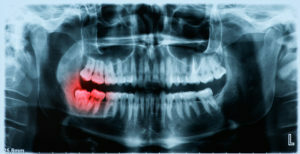 Infection – Wisdom teeth partially erupting through the gums can lead to infection, as bacteria are attracted to the area. Tumors or Cysts – Another possible result of impacted wisdom teeth is the growth of tumors and/or cysts. Untreated, this can eventually lead to damage to the jawbone and other teeth. Before your wisdom teeth get out of hand, seek the help of a sedation dentist in Asheville who will closely monitor their development with advanced digital technology, and suggest an extraction when the time comes. This will afford you the comfort of knowing that you are protected and able to maintain optimum oral health. So make the wise choice and be proactive with your wisdom teeth. John White, D.D.S., FADI, FAGD graduated from the University of North Carolina at Chapel Hill in 1988 with his Bachelor of Science Degree in Chemistry. After working as a researcher in the pharmaceutical industry, he went on to earn his Doctor of Dental Surgery in 1995. Since then he has received extensive training in sedation dentistry, and completed a separate year-long externship in the placement and restoration of several different types and brands of dental implants. He practices at John White DDS and can be reached for more information about his services through his website.